Home › Cardinals › We Need New Thinking, Not New “Wrapping,” Cardinal. We Need New Thinking, Not New “Wrapping,” Cardinal. 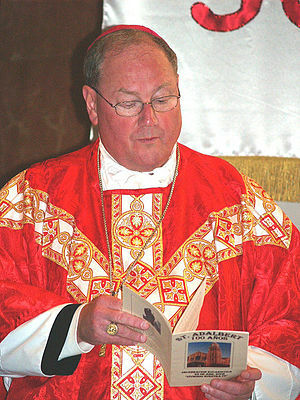 We are told in the latest New York Times’ gushing profile of the “charming, cheerful cardinal” that Timothy Dolan can “work crowds like a gifted politician,” has a “strikingly contemporary worship style” and a “million-dollar personality.” But the Cardinal, apparently, is also tone deaf. Lay Catholics are not children to be won over or distracted by prettily wrapped presents. Lay Catholics are not slow to understand and in need of new visual aids or trinkets. New packaging will not help us be more appreciative of old re-gifted teachings that should be put away, not passed on. The practices of the past have given us the leaders of today. To go forward, we need leaders with better listening skills and some measure of respect for the laity. The extraordinary elevation of the clergy and the over-concentration of power at the top in a climate of secrecy and feudal obedience have had tragic consequences. Children and women and LGBT Catholics have suffered greatly from teachings that have become disconnected from reality. It is time for the leaders of the church to leave behind the culture of secrecy and monarchical power in which they wrapped themselves for too long. We need a simpler, plainer, church. And clergy less attached to the kind of grandeur we associate with corporate executives and heads of state. If church leaders could find the courage to dispense with some of the trappings of power and relinquish their attachment to systems of dominance that have long outlived whatever use they might once have had, the radiance of the Gospel might stand a better chance of shining through. And so we pray. ‹ Out of “Horrible Inconsistencies,” a New Pope? What if…nothing changes? That should be the big question that Catholics must ask themselves because the probability of nicer wrapping in this deck of cards so far. I would propose Catholic Exile whereby many folks can retain their belief system, associate or affiliate with other churches and give them some of their best and purest ideas and plans, and wait for change while creating it outside of the Catholic Church per se. Kind of like the Cubans who defected years ago…they were never not Cuban but they assimilated into other cultures and brought a rich history with them. I would propose a branch of Catholics who believe that women deserve a long awaited anointing to priesthood and changes to reflect the simpler style of reaching the masses form now and be ready for a transforming change in whichever countries will accommodate them. Don’t wait till this foolishness exhausts everyone and people leave in bitterness. Go towards the light. Go to Jesus. Don’t wait anymore. Go. Thanks for your affirmation, Richard–and for your thoughtful suggestion, Kaysie. I think we are headed in the direction you describe. See the comments and discussion on http://feminismandreligion.com/2013/03/05/let-the-walls-come-tumbling-down-by-dawn-morais-webster/ They would welcome your perspective. I got caught in a conversation after the eucharist yesterday, so I missed seeing you and John. However, I did want to tell you how much I enjoyed this post on your blog. I was especially touched by the title. How true! New thinking, not same old, same old with a new color or design. I don’t have much hope that will happen, but one never knows where the Spirit blows. You do have a gift for capturing the thought. Thanks! Fr. George J. Cerniglia, S.M. Fr. George, Hearing from priests like you, knowing you are indeed listening and are in agreement is a great comfort and source of hope. The same NYT that ran the fawning story on Cardinal Dolan also ran a painful, thoughtful piece featuring a French woman, a former hostage of Islamists in Niger who waits for news of her still captive husband. She quotes the poet Guillaume Apollinaire: “How slow life is, and how violent hope is.” We might well invoke the same thought about the church. Another Amen! Also, your train of thought and comments not only apply to the the Catholic hierarchy, but also to government(s) — especially the US Congress.